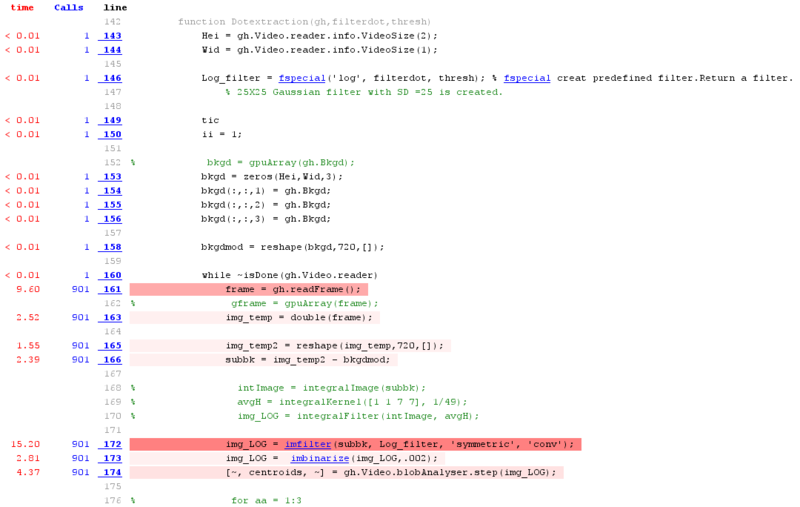 I am currently in the process of optimizing my code to make image processing more efficient. my first problem was due to the vision.VideoFileReader and step where it took a long time to open each frame. I speed up my code by compressing my grayscale image into 3 frames in 1 RGB frame. This way I could load 1 RGB frame using vid.step() and have 3 frames imported ready for processing. Now my code is running slow on the Laplacian of Gaussian (LoG) filtering. I read that using the function imfilter can be used to perform a LoG but it appears to be the next rate limiting step. Upon further reading, it appears that imfilter is not the best option for speed. Apperently MATLAB introduced a LoG function but it was introduced in R2016b and I'm unfortunately using R2016a. Is there a way to speed up imfilter or is there a better function to use to perform a LoG filtering? Should I call python to speed up the process? Log_filter = fspecial('log', filterdot, thresh); % fspecial creat predefined filter.Return a filter. % 25X25 Gaussian filter with SD =25 is created. The Laplace of Gaussian is not directly separable into two 1D kernels. Therefore, imfilter will do a full convolution, which is quite expensive. But we can manually separate it out into simpler filters. If you are really strapped for time, and don't care about precision, you could set cutoff to 2*sigma (for a smaller kernel), but this is not ideal. Not the answer you're looking for? Browse other questions tagged matlab image-processing optimization filtering gaussian or ask your own question. Is there any Difference of Gaussians function in Matlab?